Wherever I have been in Wales, I have experienced nothing but kindness and hospitality, and when I return to my own country, I will say so. 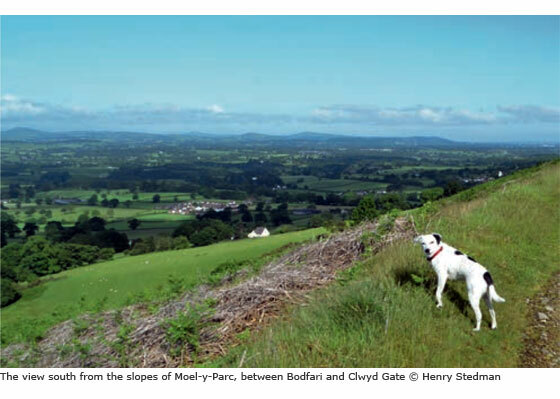 For 177 miles (285km), from Prestatyn in the north of Wales to Chepstow in the south, the Offa’s Dyke Path winds along the English–Welsh border, roughly following the line of the 1200-year- old frontier earthwork for which it is named. This magnificent long-distance footpath ranges over terrain as diverse as any you will find in Britain; it traverses the whaleback ridges of the Clwydian Hills, follows canal towpaths and old drovers’ roads, goes beside the banks of the meandering Severn and Wye rivers, through the Shropshire hills and over the Black Mountains. The Border Country is the land of Merlin and Arthur, a land of history and legend, from which sprang Owain Glyndwr and the Lord of the Rings. To journey through it on foot is the finest way to discover one of Britain’s best-kept secrets. You leave the North Wales coastline for a bracing walk over the Prestatyn hillside with its awesome views of the mountains of Snowdonia before you take to the small lanes and hedgerows of the Vale of Clwyd. This farmland introduction gives way to the splendid ridges of the Clwydian Range and fine walking. Beyond Llandegla you enter a region that might be part of Tolkien’s Middle Earth, the limestone cliffs and screes of Stack Rocks (Eglwyseg Crags) above the festival town of Llangollen. Then you follow the canals, crossing the magnificent Pontcysyllte Aqueduct, before the inspiring views of the Marcher castle of Chirk herald your first glimpse of the Dyke itself. You continue across the Severn Plain on a more modern man-made embankment with panoramic views of the Breidden Hills and then go up to the Iron Age hill-fort of Beacon Ring with its crown of trees. As you approach the halfway mark at Knighton, ‘the town on the dyke’, you come to a part of the route aptly named the Switchbacks. Then it’s on to Kington and the Hergest Ridge, a place of heather, gorse and wild ponies, with extensive views of Housman’s ‘blue-remembered’ hills of Shropshire and the Black Mountains of the Brecon Beacons National Park. Hay-on-Wye, with its 30 or so second-hand book shops, is a welcome stop for a night. From here the trail climbs over Hay Bluff to the Hatterrall Ridge following the spine of this fine massif. From Pandy you pass through a hidden world of intimate vil- lages and quiet byways where you’re likely to meet only live- stock and farm people. Monmouth is well worth exploring before the long walk down the River Wye’s wooded slopes, pass- ing Tintern Abbey, to Chepstow and the end of this superb trail at Sedbury Cliffs.